StoryCorps, the initiative that helps give people the opportunity to record, share, and preserve their own personal stories, has been around since 2003. What started out as just an idea and experiment from founder Dave Isay turned into an American success, and it’s now a global project. 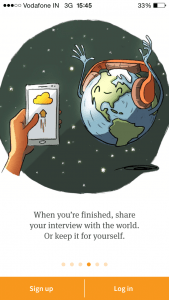 Isay is the winner of the 2015 Ted Prize, and with the funding from the million-dollar award, he and the StoryCorps team have launched the new StoryCorps app. A week after the app launched, I got the chance to talk with Isay on Skype about StoryCorps, its app, and what it means for the future of the oral history project. Below is our edited conversation with some audio clips. Sonia Paul: Dave, could you please just introduce yourself and StoryCorps a bit more, for people who might not know much about it? Dave Isay: Sure. 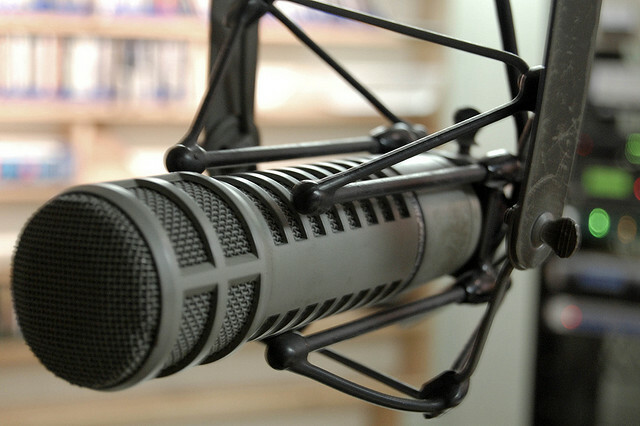 I’d been in public radio for many, many, many years and used to make documentaries for NPR. But I was always an independent journalist, and then had this idea about a dozen years ago to start StoryCorps. I did all social justice documentaries, and saw when I did these documentaries that people who felt like they hadn’t been listened to before, that the act of being interviewed could be an important moment in their lives, sometimes a transformative moment in their lives. I could literally see people’s backs straighten when they’d be listened to for the first time, whether it was in a prison, or psychiatric hospital, or wherever it was. So I had this crazy idea twelve years ago to start this project that kind of, in a way, turns documentary on its head, at least broadcast documentary. And it says that the purpose of what we’re doing is not about the final product. It’s not about doing interviews to create the final product; the purpose is the interviews themselves. I wanted to give many, many, many people the chance to be listened to in this way. So I put a booth in Grand Central Terminal where two people can come, and they’re met by a trained facilitator. You sit in basically a soundproof booth for forty minutes. And you have a conversation. And a lot of people think of it as, “If I had forty minutes left to live, what would I say to this person, or ask of this person who means so much to me?” So very intense conversations. At the end of the interview, you get a copy. And another copy stays with us and goes to the American Folklore Center at the Library of Congress. So your great-great-great grandkids can somehow get to know your grandmother through her voice and stories. So it was a kind of crazy idea that took a little while to take off. But it worked, and we’ve now recorded about 65,000 interviews, with about 100,000 to 110,000 people. Most people come in pairs, across America, all fifty states, thousands of cities and towns, in eighty different languages. It also turned out that there was pretty amazing content coming out of these interviews. So we also have broadcasts on NPR every Friday, and we’ve done animations for PBS. We have a couple of dozen of those, and we have books that have come out, all of which just celebrate the poetry and wisdom and beauty in the words of everyday people all around us. And it’s a project about listening, and helping us recognize our shared humanity — that if we spend a little more time listening to each other and a little less time shouting at each other, we’d be a better and stronger country. So it very much speaks to the core values of public broadcasting. Here’s an example of one of a StoryCorps animation: “Danny and Annie,” a married couple who recount their twenty-seven-year romance, from their first date to Danny’s final days with terminal cancer. 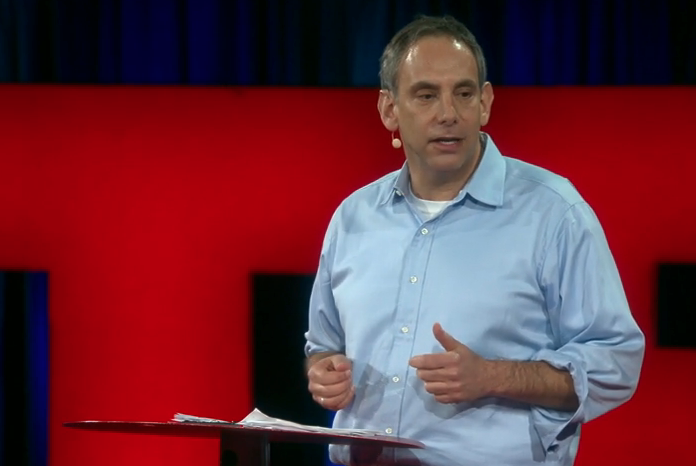 Dave Isay: And then a couple of months ago, I got word of this Ted Prize. Ted is the amazing organization that has the conferences and does these videos that everybody knows about. I had actually never even seen a Ted Talk. I was the last person in the universe, when they called me and told me I had been nominated for this thing. But I’ve since seen a bunch, and they asked me to come up with a wish for humanity, which I did, and then got a call a few weeks later which said that I’d won, and then a couple of weeks ago gave a Ted Talk where we announced what that wish was. And we’ve created an app that takes StoryCorps out of the booth and gives anybody, anywhere, the chance to record a StoryCorps interview. 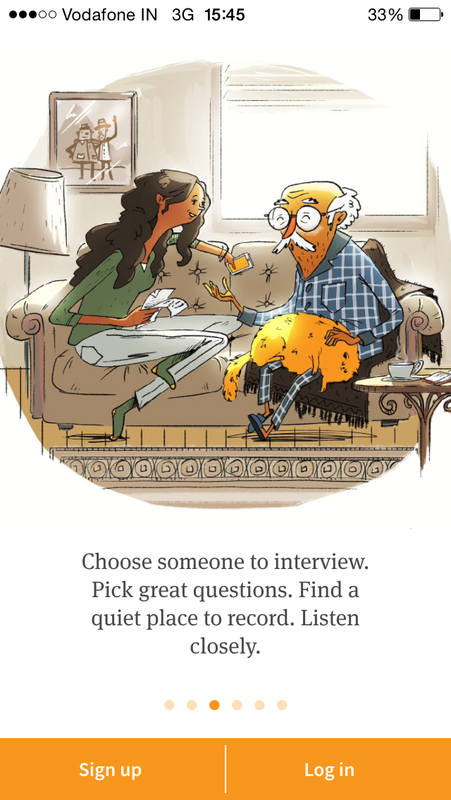 It’s basically a digital facilitator that walks through the StoryCorps process, and then with one tap you can upload your interview to the Library of Congress. So that’s a very, very long answer, from Brooklyn to India, to your question! Sonia Paul: Ok, thank you. And so, just to make sure we’re understanding correctly, has StoryCorps always worked with the booth setup, in that two people or more duck into the booth to do the interview? Dave Isay: Yes, well they don’t duck into a booth. Because now it’s very hard to get an appointment. You know, you make a reservation. And you come into the booth, and you record the interview with the help of a facilitator. We also do these in quiet rooms around the country. What changes with the app is that the app becomes the facilitator. So that allows us to do many, many more interviews, and you don’t have to come to StoryCorps, you don’t have to make a reservation. Anyone can do these interviews. And, you know, it’s an experiment just like StoryCorps was an experiment 11 years ago when we opened up. And we’re going to see — you know, we’ve seen, really, a tremendous response. I don’t have the stats today, but it’s obviously growing very, very quickly. If you go on the site and see the interviews that are coming in from all over the world. And we’ll see what happens. 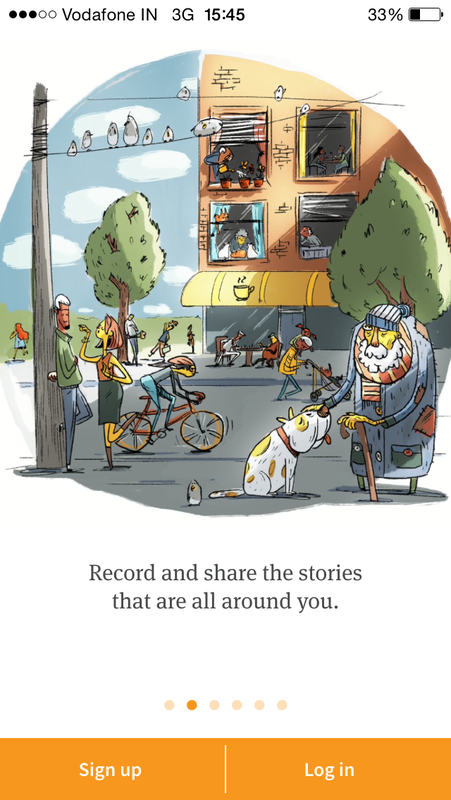 Screenshots from the StoryCorps app. It walks you through the process of doing an interview. Sonia Paul: Yeah, and so I was curious about this idea of the app becoming a digital facilitator. Do you think that having the other human being there in the beginning ever added to the experience in any way? Dave Isay: Of course, yes! I mean, having the facilitator there was huge. But you can’t scale. You know, obviously our facilitators are paid; they’re highly trained. But, you know, we’re doing 5,000 interviews a year, 6,000 interviews a year. And that is the gold standard of the StoryCorps experience, and it always will be. But it was time to experiment and see if we could spread this wider and spread this to places where we couldn’t necessarily go with facilitators. So again, it’s an experiment. And having a facilitator is great. We do our best to approximate the facilitator with the phone; we’ll see how it works. I’m very encouraged by the interviews that are coming in that, from what I’ve heard, and again, they’re coming in far more quickly than what I had expected, a week into it. But people are being respectful, and they’re taking it seriously. You know, they’re not the same as StoryCorps interviews, but people are having the opportunity with this app to, you know, have meaningful conversations. And that’s what it’s all about. Sonia Paul: And so what kind of hurdles are you anticipating in getting the app off the ground, if anything? Dave Isay: My first hurdle was that I didn’t think anybody would use it. I mean, the technique is the easy part. When we started StoryCorps, no one actually came to the booth. And it took years before people understood what was going on, and we ended up kind of selling out the booth, and that was because of the public radio broadcasts. But, you know, there are stories coming in from all over the world every couple of minutes now. I did not expect this kind of pick up this quickly. I’m not sure what’s going to happen with it [the app]. But I think what we need to do is we need to keep pushing out best practices to people, and encouraging them to do interviews that approximate the StoryCorps experience as closely as possible, and get the word out. And especially because StoryCorps was born out of a kind of social justice, documentary work to, make sure that people who feel like their voices are least heard know about this and have the opportunity to be heard through the app. Sonia Paul: Right. Yeah, and I downloaded it, and I was looking through it. I mean, obviously not everyone in the world speaks the same language, but the default language for the app right now is English. So I was curious, how do you plan to make it available in other languages and work around issues of translation and interpretation? Dave Isay: We’re going to translate it into other languages. I mean, this is all very new. But, you know, the app has been created in a way where we can swap other languages. Ted has a community of translators who are getting to work to start translating this thing, and we’ll have a plan and slowly roll it out, depending upon resources, in other languages, as time goes on. Sonia Paul: So I have a question now that’s not directly related to StoryCorps, but it’s kind of related. Have you been paying attention to the emergence of these sort of live broadcasting tools like Meerkat and Periscope? Dave Isay: Yeah, two weeks ago, yeah. Sonia Paul: Yeah, so now people can essentially livestream their lives to the world. And now, with social media, putting a status update on Facebook or Twitter is pretty normal for a lot of people. And obviously, StoryCorps is very different from those things because the point has always been to preserve the art of that interview. But do you think we, as a society, are sort of heading in a direction in which people are becoming more accustomed to simply blasting out their lives more, rather than asking the kinds of questions to others that we need to ask in order to actually understand? Dave Isay: Yeah, I don’t know. I mean, I do feel like StoryCorps is different. I mean, StoryCorps is an act of generosity. It’s about listening to another person. And it’s kind of the opposite of the selfie, right? And I do see there are some interviews where people are getting on and doing their own life story, and it seems to be helpful to them. I mean, I’m looking at what’s come in in the last couple of hours, and, you know, it’s mostly people talking to each other. I do think that this is different. The stuff that I’m hearing — and I’m not a tech person, I am not that interested in a lot of tech stuff. But from what I’ve seen from social media and elsewhere, the kind of stuff happening on this app feels very different than what you see elsewhere. Sonia Paul: And if you happen to know, what countries are using the app? Dave Isay: You know, you’d have to look. I don’t even — I can’t even recognize the languages. If you browse, it seems like a lot of them are in the U.S., from like, all kinds of different towns. It’s largely younger people who are using it. But, you know there’s Arabic and there’s French, and you know, I don’t know. You’d have to check. And I haven’t had. And you know, it’s Monday morning, and we haven’t gotten the status yet of what’s happened over the weekend. But they’re clearly coming in from all over the world. And unfortunately, we don’t have geo-locate yet on this app, so I can’t easily tell you. But that’ll happen in a couple of weeks. Sonia Paul: Right, and so, just to be clear, you’re using the funding from the Ted Prize to go forward with this app, that’s how you’re able to do it? Sonia Paul: Oh, right, used! But was the idea for the app something you had before the Ted Prize, though? Dave Isay: Yeah, but it wasn’t going to happen. Doing something global and doing this app wasn’t going to happen in the next five years, until the Ted Prize came around. But you know, Ted is about digital, and it’s about global. So there was only one way to yes to work with them. And I’m glad. You know, it’s a great thing. It’s great to be pushed out of your comfort zone, and this was a real push. And it’s exciting to see where it’s going. This piece originally published on April 7, 2015, on PBS MediaShift.